Nigel Lawson, not a scientist, but confuses public about science helped by the BBC. "When covering climate change stories, we should not run debates / discussions directly between scientists and sceptics. If a programme does run such a discussion, it will... be in breach of the editorial guidelines on impartiality." Anthony Watts wrote a response in his usual elderly statesman manner; it was titled: "Climate change campaigners fear debate, can’t face climate skeptics anymore, so they rig TV news shows". No link, you can find the cesspit yourself. Note the word fear that is so important to the conservatives and the concealed message that climate scientists are climate change campaigners. [I]t is not the case that “the new policy of the BBC is to no longer have debates between climate scientists & climate "sceptics"” as you state – our policy is and remains that all views are given due weight in BBC coverage of the issue. Sounds like the bad news for Watts' blood pressure and the good news for science and democracy is wrong. The BBC will continue having fake debates on climate science. Or at least there does not seem to be a BBC-wide consensus opinion yet. What I found especially worrying is that the BBC does not distinguish between false balance ("due weight") and fake public debates. They are related, but separate problems. Why is this a problem for democracy? I would like to explain the importance of accurate media reporting on climate science using a great new video that was just released called Can we trust scientists? h/t The New Anthropocene. It reminds us of the huge trust the public has in science and contrasts it to the large percentage of people holding opinions that deviate from the scientific consensus. Not only when it comes to climate change, but also evolution and vaccination. It argues that people who know of the consensus generally accept it. This makes sense because a consensus opinion is much more reliable as the opinion of single persons. However, many people have the wrong impression that scientists are not sure yet whether climate change is a problem. Also the climate dissenters often claim there is no consensus. The video argues that vocal individual dissenters and the press are responsible for the misperception of how sure scientists are that climate change is real. The problem with the press is that they like controversy and that they present both sides as equal. I think that the press is just part of the problem. Some people seem really determined not to understand what science has found. And I am not so sure whether the solution presented in the video, reading and watching bloggers and YouTube v-bloggers, will help. But maybe WUWT and Co. have damaged my trust in blogging. Apart from that, this is a video well worth watching and sharing. 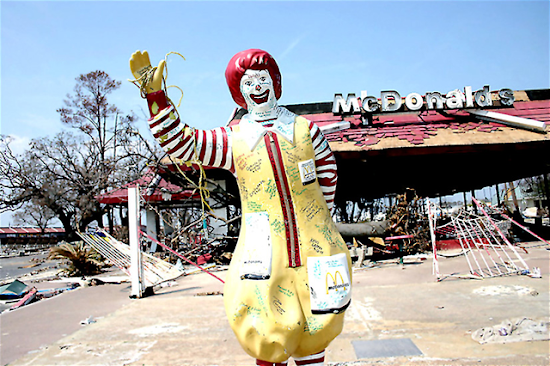 Ronald McDonald enjoying himself after Hurricane Katrina. The kind of "conversations" I am having in the so-called climate "debate" made no sense to me until I asked myself the question whether climate dissenters might like climate change? Maybe a strange question, but it would explain a lot about the debate. Take Watts Up With That (WUWT), the largest climate dissenter blog. The mainstream opposition of the IPCC. Every post I have read there on a topic where I am knowledgeable contains serious errors. The other posts are likely not better. HotWhopper finds errors on WUWT that make one cringe every single day. Lord Monckton is a living symbol of the fact that many climate change contrarians will believe anything that seems to support their case, even if it’s coming from the most ridiculous source. [N]o one here complained about being misinformed. No one said, I do not believe in climate change, but Forest Mims misinformed me and that is wrong. I do not like being misinformed and I feel that this gives our community a bad reputation. They were happy to discuss any other typical climate ostrich meme or ask: "Do you feel any amount of shame for helping promote death?" The clear misquotation was not interesting, however. That is not what one would expect from a group that wants to develop an alternative to mainstream science. In discussions with dissenters I get the impression that they make a determined effort not to understand what the others write. This is especially visible on twitter where you only have 140 characters and cannot be very precise. With colleagues and people that accept the science, this imprecision is no problem, they make an effort to understand you and normally manage to interpret the text in the intended way. I try to avoid such "discussions" on twitter, but see others try and end up in endless twitter streams that go nowhere. As an example, see this post by AndThenTheresPhysics about a discussion on twitter and elsewhere on whether greenhouse gases warm or cool :-) the Earth surface temperature. I've now spent abt 2 weeks of my time trying to convince various pple that the greenhouse effect exists. I think that's enough now. Such unproductive discussions are unlike anything I know and especially unlike anything I am used to among scientists. Climate dissenters, for example, often dodge the discussion by moving to new topics before agreement on first topic is made. That does not give the impression that the dissenter wants to understand the reason for the difference of opinion. And it does not show much confidence that one's opinion holds up to scrutiny. In the scientific community, you stay at one topic, try to find out where you agree, where you do not agree and why you do not agree. Until you arrive at statements that are so simple that rational persons can agree upon whether it is true or not or what research would need to be done to verify them. This part of the rant is getting too long. Let me just state that I do not have the impression that the climate dissenters want to understand the climate better. They mainly seem to want to have some fake "arguments" for discussions, to have some fodder to annoy greenies. This impression fits to the large differences in acceptance of the science between political groups. The rather remarkable consensus of the US Tea party supporters is that global warming does not pose much risk, for example. This suggests that people arrive at their opinion about climate science based on their political positions and not based on arguments. It could be that the dissenters just find science largely irrelevant compared to their political views and good relations with peers who hold similar views. However, it may go beyond that, I have the impression that the climate dissenters do accept the science and are just mocking opposition, because they do not trust themselves to say that they like climate change. Partially their liking may also be subconscious. Humans are complex. Before I explain why climate dissenters may like climate change, I have to make a detour and explain how a Salmonella infection works. I do not want to compare climate dissenters with a disease, but I need the mechanism. If someone knows a similar evolutionary mechanism for cute fluffy animals with big eyes, please tell me so in the comments, then I will replace this part. Evolution is a beautiful topic. Many people just think of survival of the fittest and in the worst case think that this fitness has to do with building as much muscle as possible in the fitness studio. The intricacies of evolution are well illustrated by the famous creed: "Evolution is cleverer than you are." Also the evolved behavior of Salmonella about with I learned a year ago via a Nature article (pay-walled, press release) is full of beautiful surprises. Salmonella attacks the intestinal lining of the gut and thus provokes an immune response. What I had not realized is that this immune response actually helps Salmonella to reproduce. While the immune response also hurts Salmonella, it hurts the other bacteria much more and thus makes the niche for Salmonella larger. They are suffering, but the others suffer more. Relative suffering is their survival strategy. That is the mechanism that is important for this post. Producing the proteins that provoking the immune system comes at a cost. Thus Salmonella bacteria that do not produce them can reproduce faster. Mutant Salmonella bacteria that are just as good in withstanding the immune system, but do not help in provoking it, thus have a fitness advantage. From the perspective of a sick human it is somewhat strange, but from the Salmonella perspective the active bacteria are altruists that help the other Salmonella and the passive mutant Salmonella are the parasitic free-riders. Once the mutant Salmonella gain the overhand, the immune system goes down and the other bacteria again grow strong and remove the mutant Salmonella, which is the end of the infection. This mechanism was what made me wonder whether some people might like climate change. Yes, it will bring suffering over everyone, but they may think that others will suffer more than they will (and their children) and that climate change thus improves their relative fitness. A short post. Asking the question is answering the question. "We are woefully underfunded and under resourced. Every sceptic I know of has to fund their own projects and have jobs unrelated to their interest in climate. It takes me a year to research my large articles. Who funds me? No-one. Can I afford the time and money? No. Could I do more if Big Oil funded me? Of course. But they don’t, because money from this source for sceptics is completely imaginary. " Big Oil prefer to give their money to politicians and PR firms, not to research. That Big Oil does not fund research suggests that even they think mainstream science is solid. Very solid. If they had just the smallest bit of doubt, it would pay off for them to fund studies on climate change big time. They have so much to lose that money would be largely irrelevant. They already do much research themselves and also fund much external research. Universities get funding from oil companies for a large range of other research topics. Thus the structures are in place, the money is there. If I had a good idea and could not get funding from national funding agencies, I would have no problem with accepting money from companies. My university certainly would not. Not that I not expect to have problems with a research proposal because it would challenge the mainstream. On the contrary, I expect that a proposal that challenges the mainstream would have more chances of being funded. Is anything more beautiful fundamental research? Another rhetorical question. However, maybe for more speculative ideas, that are likely to fail, the profit motive of an oil company could improve my funding opportunities. Most scientists would be happy to use such an opportunity. Poor climate ostriches, not even their oil companies believe in them. The post explains in more detail how the BEST daily method works and presents some beautiful visualizations and videos of the data. Worth reading in detail. When I understand the homogenization procedure of BEST right, it is based on their methods for the monthly mean temperature and this only accounts for non-climatic changes (inhomogeneities) in the mean temperature. The example of a move from black roof in a city to an airport is also a good example that not only the mean can change. The black roof will show more variability because on hot sunny days the warm bias is larger than on windy cloudy days. Thus part of this variability is variability in solar insolation and wind. Also the urban heat island could be a source of variability, the UHI is strongest on wind and cloud free days. Thus part of the variability in observed temperature will be due to variability in wind and clouds. A nice illustration of the problem can be found in a recent article by Blair Trewin. He compares the distribution of two stations, one in a city near the coast and one at an airport more inland. In the past the station was in the city, nowadays it is at the airport. The modern measurements in the city that are shown below have been made to study the influence of this change. For this plot he computed the 0th to the 100th percentile. The 50th percentile is the median, 50% of the data has a lower value. The 10th percentile is the value where 10% of the data is smaller, and so on. The 0th and 100th percentile in this plot are the minimum and maximum. 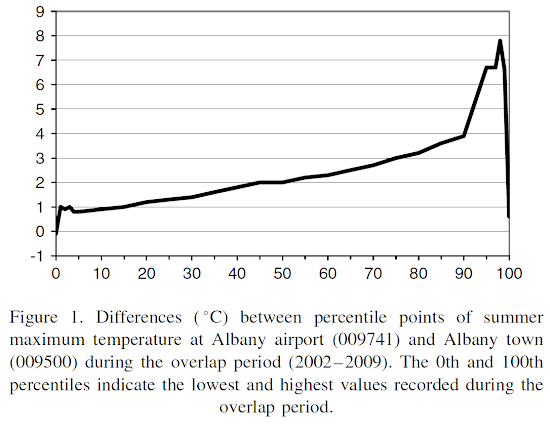 What is displayed is the temperature difference between these percentiles. On average the difference is about 2°C, the airport is warmer. However, for the higher percentiles (95th) the difference is much larger. Trewin explains this by cooling of the city station by a land-sea circulation (sea breeze) often seen on hot summer days. For the highest percentiles (99th), the difference becomes smaller again because offshore wind override the sea breeze. Clearly if you would homogenize this time series for the transition from the coast to the inland by only correcting the mean, you would still have a large inhomogeneity in the higher percentiles, which would still lead to non-climatic spurious trends in hot weather. Thus we would need a bias correction of the complete probability distribution and not just its mean. Or we should homogenize the indices we are interested in, for example percentiles or the number of days above 40°C. etc. The BEST algorithm being fully automatic could be well suited for such an approach.